Upon the instructions of President Bashar al-Assad the Commander-in-Chief of the Army and Armed Forces, Deputy Commander-in-Chief and Defense Minister Gen. Ali Abdullah Ayoub conducted a field visit to a number of army units operating in the northern and northwestern countryside of Hama province. 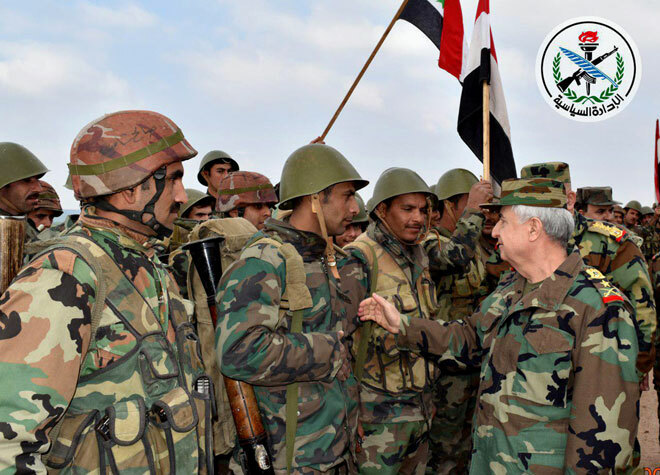 Gen. Ayoub relayed to the soldiers President al-Assad’s appreciation of their heroic actions, and provided field commanders with directives for carrying out their tasks so that 2019 will be the year of complete victory over terrorism. The field commanders briefed Gen. Ayoub on the nature of their tasks and the combat operations against terrorists who continuously breach the Sochi agreement. The Defense Minister lauded the high morale of the soldiers, stressing that the victories achieved by the Armed Forces against terrorists were made possible by the absolute faith in victory and total commitment to the homeand.